Shopping for Overwatch Action Figures? From the globally popular multiplayer first-person shooter game Overwatch comes the Overwatch Tracer Classic Skin Nendoroid Action Figure! The 3 9/10-inch tall Nendoroid comes complete with a variety of optional parts to add effects for her abilities, interchangeable bent legs, and hair options that can cover up her eyes to recreate her iconic poses from the game! Also included are Tracer's trademark pulse pistols, along with open hand parts to pose her as without her guns, like when she activates her recall ability. Equip her pulse bomb to pose Tracer activating her ultimate ability! 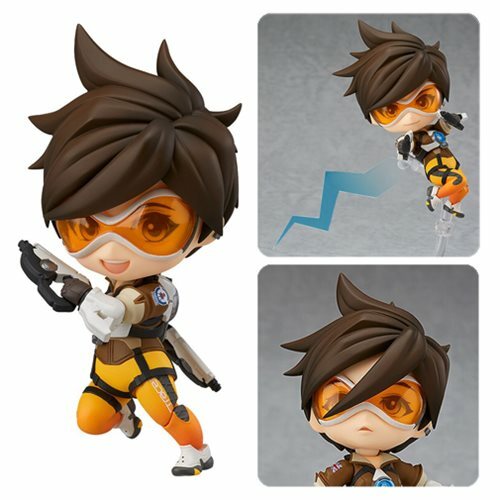 The Overwatch Tracer Classic Skin Nendoroid Action Figure is fully articulated, allowing her to be posed in many different ways, and has been carefully sculpted and tuned to ensure that the joints do not stand out, keeping Tracer's unique appearance in tact. Be sure to add the first of the Overwatch Nendoroid series to your collection! Ages 15 and up.